Highway 547 north of Grants, New Mexico affords many more interesting views than this – but I can’t drive and take pics when the road goes all over! The Mt. 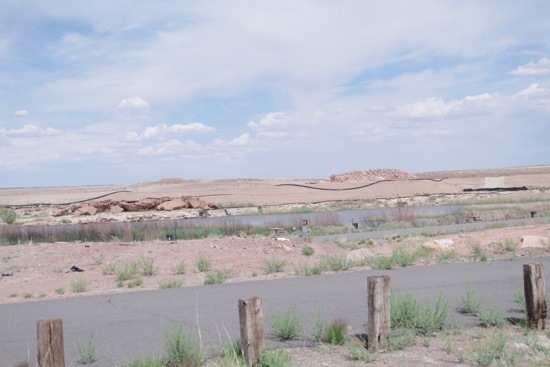 Taylor Ranger District of the vast Cibola National Park is less than 40 miles from Bluewater Lake State Park in New Mexico. 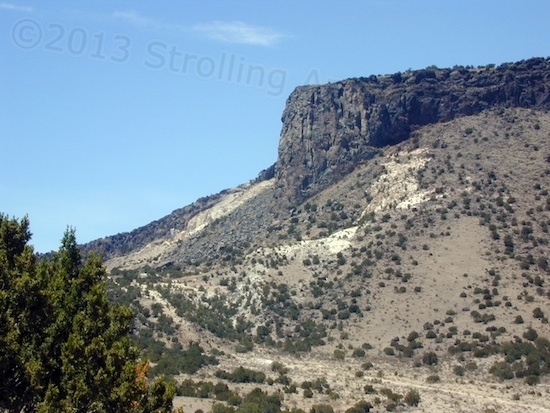 Highway 547 is torn to shreds in town, but once north of Grants, it winds beautifully through the mountains. Up I went, to my present elevation of 8535 feet, according to my GPS. For the geeky, my coordinates are 35.253806, -107.67122. Put those numbers into Google Maps, and you can see where I am. I’m actually on FR193TV, a short spur off of FR193. 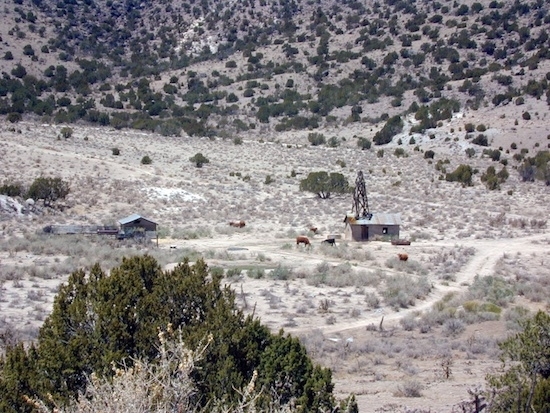 I pulled over to get this one – a small cattle ranch in a valley. Greetings from McHood Park! McHood Park is several miles south of town, and is quite picturesque. A stiff wind has suddenly come up since I arrived at about 2:30, but that doesn’t affect the view. I’ll be staying here overnight, but could theoretically stay for about a week and a half if I wanted to. At the moment, the thermometer reads 97 degrees, so I may not. The data signal is courtesy of a tall tower I passed on the way out here. As far as I’m aware, FR573 is at about 5K feet, and on the way here I passed over the “Arizona Divide” at 7K feet. It’s been downhill from there, probably back to 5k. A modest tailwind netted me 12.5 MPG overall, which was a geeky delight. From tent to luxo-motorhome, the views are the same. How you want to get there and stay there is entirely up to you. 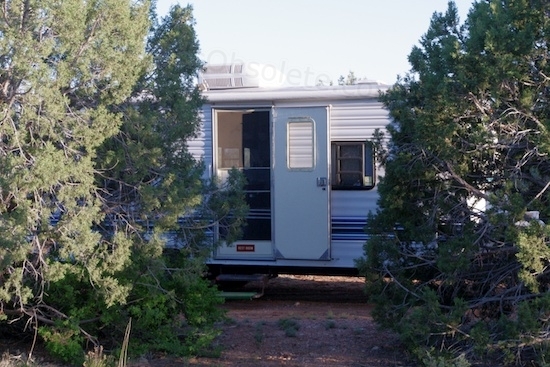 My own interest in small mobile living started a year and a half ago, while web surfing. The Tiny House movement first caught my eye, and I found the comparative simplicity fascinating from both technical and lifestyle standpoints. What a contrast to conventional, cattle-yard consumer living! 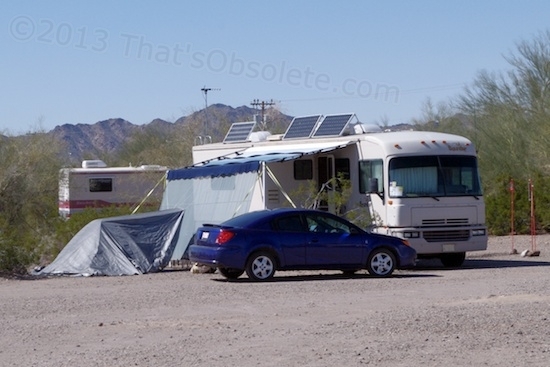 Then, when I stumbled over Bob Well’s VanDwelling websites, it was like “Tiny House on Steroids” because of its much higher emphasis on mobility and economy. Oh, this porridge is way too hot! Having already had many skirmishes with my Inner Packrat, such a simple lifestyle was a smack-in-the-face wake up call. I began to look inward, and to slowly try to figure out how close I could come to the tenets of VanDwelling without exceeding what I felt I could realistically adapt to, long-term. This exercise was just for fun, and the answer was: Not real close. …And this porridge is too cold! But, decades of typical suburban living under an increasingly bad economy, age discrimination, and jobs moving offshore had left me feeling frustrated. I was now working a minimum-wage job to try to assist with the maintenance, mortgage, and taxes of home ownership. It wasn’t much of a help, and the mismatch of duties and skills was wearing. As a mental escape, I couldn’t help daydreaming about permanent, full-time mobile living. It seemed intriguingly different, and the mindset and values of the people actually doing it was a 180-degree spin from everything I was used to. How were they making it work? I researched hard. The stairway to heaven. The tiny red sign on the screen door says “Rest Room”. It’s tin and I suspect it’s from the 40s or 50s. I’ve noticed that people who are familiar with RVs instantly spot me as a full-timer (and a cheapskate). The service guy never even hinted that I should have the suspension work done there, even though they already had all of the needed parts on display. He talked with the assumption that I’d be doing it myself. Back in time at the Smartweigh, the guy there, George, took one glance and offered, “I see you’ve got a working trailer.” He meant purposed for living vs recreational. 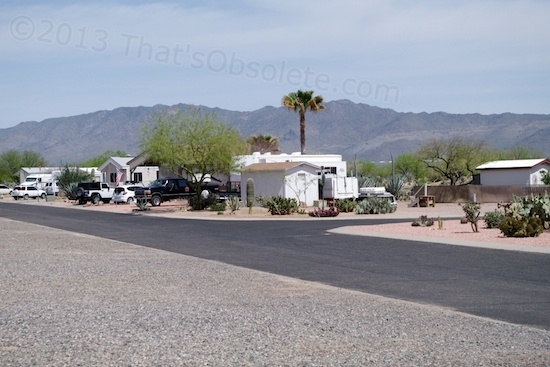 Let’s face it, travel trailers and fifth wheel trailers are 99% recreational. 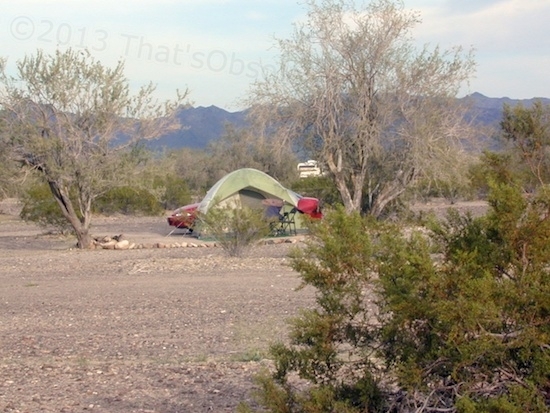 Go camping for awhile, and then go back home, put it up on blocks, and winterize the plumbing system. They’re all big and shiny, and look new. 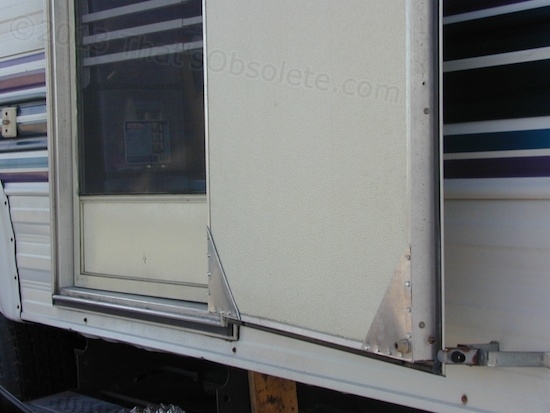 Some commercial parks don’t even let in trailers that are over ten years old. Ahhh, West and Wewaxation at Wast! Ready for… Laundry Day, don’t you think? Well, the process is over. Pull a wheel and hub. Head into Wickenburg to drop off the hub for bearing removal and replacement, and get the tire dealer to swap the rubber donut for new. When a hub is ready, pick it up and return to install it on the trailer and pull another. Rinse and repeat. It took several days because service on the hubs couldn’t be instant. Total, $844.22 for four tires, three bearing sets with seals, and the labor to pound out the old and pound in the new. Plus, a spare bearing and seal set to carry on the road. See the label still on the rear tire? I’m done, with about and hour and a half to go before sunset. 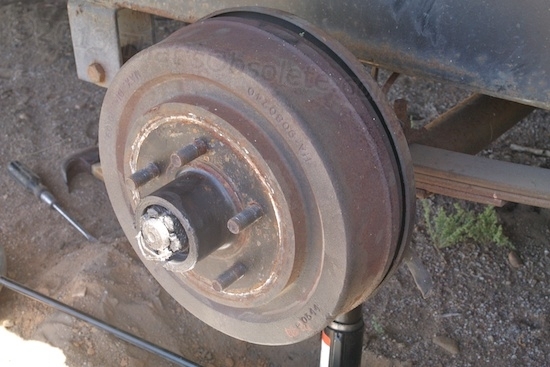 Just for morbid curiosity, I also pulled the new hub that had been replaced in Quartzsite. Expecting to find an abundance of grease, I found everything clean and dry, with just a whisper of clean grease wetting the tapered rollers. That’s not the usual practice. The mechanic here expressed his preference as, “If a bearing fails that I put in, it’s not going to be for lack of grease. These things heat up.” I slopped more in with my grease gun and a weird stem that is handy for reaching into such areas. So I’ve done all I can do, and it’s now merely a matter of hub touchy-feely and watching for tilted wheels once I hit the road again. Umm, the hub is not supposed to droop down like that. The title to this post means The Bearing is Dead. This is the second wheel bearing to disintegrate, this one 115 miles after being lubed and reinstalled. The good news is that the hub did manage to be able to be pulled off after a few hearty yanks, and the complete bearings (less loose tapered rollers) came off with it. That’s far superior to what happened on the last bearing failure. I wasn’t able/willing to pound out the bearing races held inside the hub, and made my way to Wickenburg to find a shop that could apply the necessary brute force. The automotive shop in Wickenburg wasn’t really open, this being Saturday, but people were there so I dropped off the hub and they’ll get to it Monday. I also need to drop off the rest of the bearing parts so they can try to match up what I’ve got. George and an accomplice read scales and note the numbers on a clipboard. Had Dickens been at my Smartweigh at the Escapees North Ranch in Congress, Arizona he would have summarized it as, “It was the best of times. It was the worst of times.” Although the Smartweigh is a safety-oriented number-crunching exercise, with terms like GVWR, GCWR, and GAWR, I’ll try to make the explanation of it as understandable as possible. The Executive Summary: As far as the numbers go, I’m looking good – much better than I thought. 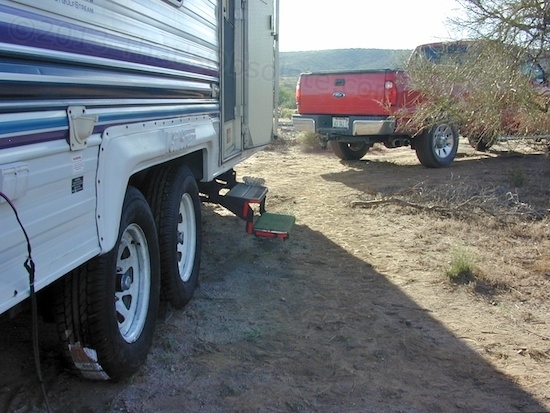 The bummer is the remaining three “original” trailer tires themselves, and the weight distributing hitch. Even though I’m not overloading any tires, it would be a real good idea to lose some weight. I’ll show you why. The Escapees’ Smartweigh system is much better than your typical truck stop scales, which weigh the tow vehicle, the trailer, and then both. All that does is give you a “yes, no, maybe so” result that tells you if the individual units are overweight. A typical North Ranch street. Wide and paved. Housing ranges from park models to modular to conventional. For $55 for a truck and trailer weigh-in, the Smartweigh test coughs up individual loads on each tire. 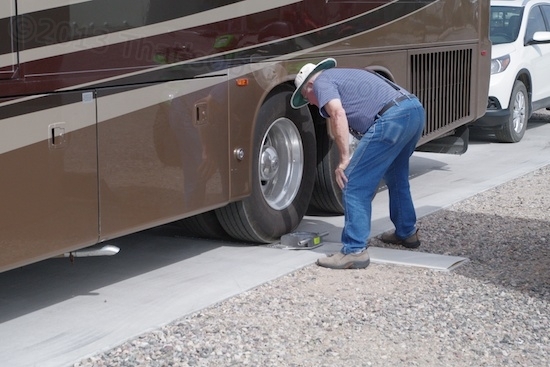 Because RVs typically load their tires and suspensions very near their load carrying limits, and do not distribute those loads evenly, it’s common to have an RV weigh in under the maximum limit, and yet be overloading one or more tires. In order to get “worst case” numbers, the RV is supposed to go into the test with all fuel, propane and fresh water tanks full, while all waste tanks are to be empty. This is the normal travel mode. The Last One! No, Really! This makes tire dealers get all excited. The rubber is splitting pretty good, and the cracks are deep – well into the “we recommend immediate replacement” territory. I’m sure some are down to the cords. A toothpick drops in deep. It kinda looks like it might be bulging a tad, too. Non-optimal condition. Naturally, I got out the cheapo scissors jack, battled it mightily to get the axle up, and removed the wheel. Took off the bike rack and dismounted the spare, which was about halfway worn but in fine shape. Easy-peazy! I’ll swap now, locate a Goodyear dealer or otherwise find a trailer tire the same 205/74R15 size, and swap again to put the new one into service! Hold on a sec. The spare is 225/75R15. Taller and wider. The wider isn’t a problem, but the taller is. 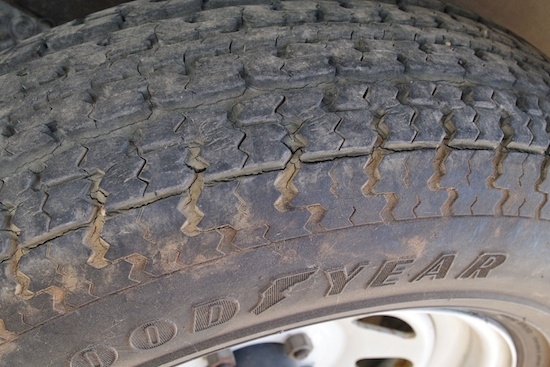 Even though there’s an equalizer bar as part of the suspension, what if this taller tire affects how the load is carried by the suspension, and so ruins the validity of my Smartweigh test? Considering the difficulty of using the scissors jack, a swap back at the weigh site and then back again afterward does not appeal. I’m not thrilled about going another 100 miles on this thing doing sixty MPH, but if I’m going to follow the Lazy Way, tomorrow I’ll ask if the RV dealer handles such tires. If not, I’ll call some tire dealers in Blythe CA, some 23 miles away. If one of them has my size in stock, I’ll put on my big boy britches, tear the offending wheel off again, and add a trip to Blythe to my busy social schedule. If I hit a dead end, I’ll be going to the Smartweigh stupidly, on that cracked tire. Adventure! Then I can change it out with the wonky spare after the weigh, and hunt for a replacement in Wickenburg or Prescott later. Sometimes even the doorway to Heaven needs repairs, I guess. I’ve been going through stacked up magazines looking for info, new things worth researching further, and reference articles I’ll need to scan and convert to PDF files. That lets me chuck the pulp versions and helps clear out the clutter. Been doing that since about 9AM, and not letting myself get distracted. So, when I finally tried to exit the trailer at 4PM, the external door seemed mighty reluctant to open! Hmmm. It’s been pretty moody ever since departing Algonquin. Easy some days, and a PITA on others. When it’s feeling peckish, it just doesn’t want to close and latch, and the lower frames look stressed and unhappy. Once open this time, it became obvious that the bottom of the door was literally coming apart. The bottom frame section had flopped down about a half inch, both side frames had spread, and both inside and outside panel surfaces were exposed at the edges and trying to go somewhere other than where they are now. 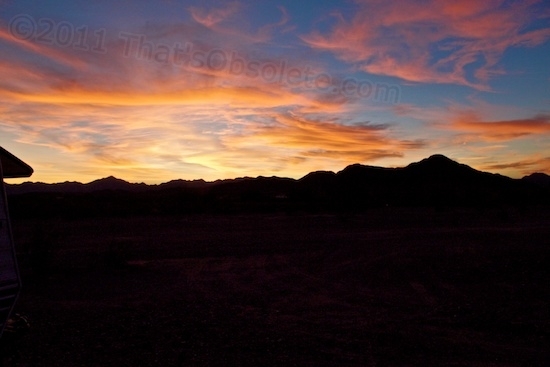 Along with unusually warm weather (highs in the upper 70s) for the next couple of days here in Quartzsite AZ, the skies are expected to be pretty well overcast until next Wednesday. Rain may come Friday and again Monday. That means I won’t be running the desktop computer much, since it’s the heaviest draw on the office battery pack. The CPAP battery won’t care much, because that device pulls so little power anyway. What will be interesting to see (in a nerdy kind of way) is how the house batteries fare. The house batteries, two ordinary ol’ flooded marine-type “deep cycle” hybrids, are the least robust cells in the place, and power interior lights, water pump, and ignitions for the propane refrigerator and the water heater. I’ll be wanting to measure their voltage as time goes on in order to see what their limit for this kind of prolonged cloudy weather is.